DEFINITION OF GOTHIC ARCHITECTURE; ITS ORIGIN, AND THE DIVISION OF IT INTO STYLES. Q. What is meant by the term “Gothic Architecture”? A. 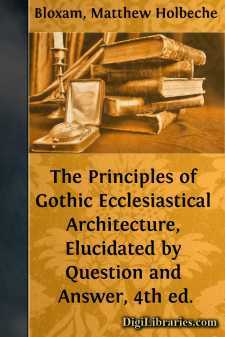 Without entering into the derivation of the word “Gothic,” it may suffice to state that it is an expression sometimes used to denote in one general term, and distinguish from the Antique, those peculiar modes or styles in which most of our ecclesiastical and many of our domestic edifices of the middle ages have been built. In a more confined sense, it comprehends those styles only in which the pointed arch predominates, and it is then often used to distinguish such from the more ancient Anglo-Saxon and Norman styles. Q. To what can the origin of this kind of architecture be traced? A. To the classic orders in that state of degeneracy into which they had fallen in the age of Constantine, and afterwards; and as the Romans, on their voluntary abandonment of Britain in the fifth century, left many of their temples and public edifices remaining, together with some Christian churches, it was in rude imitation of the Roman structures of the fourth century that the most ancient of our Anglo-Saxon churches were constructed. This is apparent from an examination and comparison of such with the vestiges of Roman buildings we have existing. Q. Into how many different styles may English ecclesiastical architecture be divided? The Saxon Or Anglo-Saxon Style, which prevailed from the mission of Augustine, at the close of the sixth, to the middle of the eleventh century. The Norman style, which may be said to have prevailed generally from the middle of the eleventh to the latter part of the twelfth century. The Semi-Norman, Or Transition style, which appears to have prevailed during the latter part of the twelfth century. The Early English, or general style of the thirteenth century. The Decorated English, or general style of the fourteenth century. The Florid Or Perpendicular English, the style of the fifteenth, and early part of the sixteenth century. The Debased English, or general style of the latter part of the sixteenth and early part of the seventeenth century, towards the middle of which Gothic architecture, even in its debased state, became entirely discarded. Q. What constitutes the difference of these styles? A. They may be distinguished partly by the form of the arches, which are triangular-headed, semicircular or segmental, simple pointed, and complex pointed; though such forms are by no means an invariable criterion of any particular style; by the size and shape of the windows, and the manner in which they are subdivided or not by transoms, mullions, and tracery; but more especially by certain minute details, ornamental accessories and mouldings, more or less peculiar to particular styles, and which are seldom to be met with in any other. Q. Are the majority of our ecclesiastical buildings composed only of one style?